Not since the SARS outbreak in 2003 has a news event gripped the city with such intensity, as live coverage of the hostage crisis in Manila unfolded on prime time television and left us in shock and disbelief. On August 23rd, what started out as a media stunt staged by a frustrated ex-cop ended in a shooting gallery leaving nine dead and three seriously injured. In the days that followed, as details of the bungled rescue were exposed, dissected and analyzed, citizens of Hong Kong united in a kind of collective anger never seen before directed at another sovereign nation. 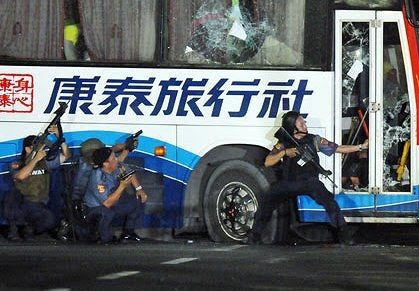 A lot of ink has been spilled by the local press over the sheer incompetence of the Manila police force. We saw it with our own eyes: rescue units performing a slapstick comedy titled Amateurs’ Night at Rizal Park. Using props from sledgehammers that bounced right off unbreakable windows to ropes that broke after a few pulls and purple glow sticks that smacked of a Halloween toy, the comedians completed their unfunny theatrical joke in front of a stunned audience 700 miles away. But the joke was on the victims and their families: a pair of young girls suddenly orphaned, a woman clever enough to save someone else’s child but not her own husband, and a mother weeping by the side of her comatose son after losing the rest of her family. Their stories tugged at our heartstrings and resonated across a city where taking a vacation in less developed parts of Asia is a national pastime. What happened to those families could have happened to any of us. As is the case for other man-made disasters, many of us are looking for something or someone to direct our anger and frustration at. Unfortunately for the 150,000 Filipino expatriates working in Hong Kong, every aspect of the hostage crisis – from the gross negligence of the police force to the public relations blunders at the national level – feeds into our racial stereotypes. However untrue and unjustified, the stereotypical Filipino, ever lazy, sloppy and corner-cutting, has been part of the Hong Konger’s psyche since the first crop of domestic helpers from the Philippines arrived in the late 1970s. Within days of the Manila Massacre, a racial backlash started to simmer. Our chief executive, in an act of bravado that could only be described as closing the barn door after the horse has bolted, slapped the country with the most severe travel advisory the next day, not as a safety measure but rather a form of punishment against the tourism-dependent economy. Legislators organizing this Sunday’s mass rally urged participants not to carry racist banners or harass Filipino passers-by. Patience and understanding are in short supply in Hong Kong this week, and the already tenuous relationship between our city and its impoverished neighbor has gotten more tenuous still. Determined to get a more balanced perspective on things, I sat down with a few of my Filipino friends earlier this week for some one-on-one, heart-to-heart discussions about the hostage crisis. Before I even began, Benny, a musician who moved to Hong Kong from Manila three years ago, asked me if the stories he had heard about Filipino maids being beaten or sacked by their Chinese employers were true. Indeed, rumors of violence and dismissals have begun to swirl within the Filipino community here. 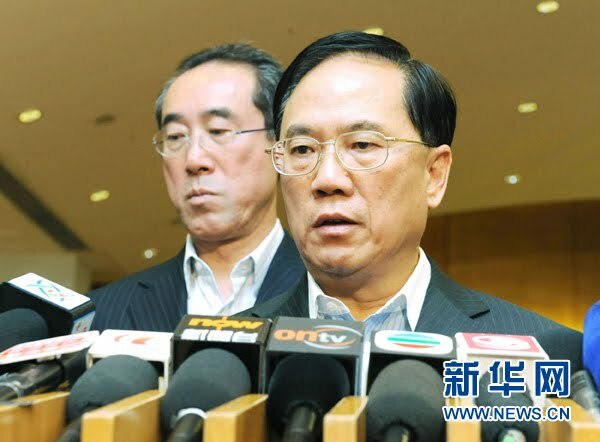 I could neither confirm nor deny these rumors, and so I instead offered Benny a rather cynical response: if there were abuses by Hong Kong people out of retaliation, the stories would have been all over the news and we would have known about it. Cold comfort, but comfort nonetheless. On the subject of police incompetence, my Filipino friends proffered a unanimous explanation. 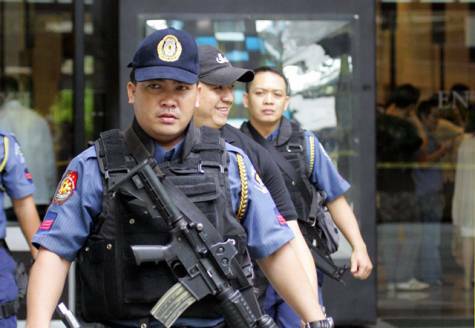 In the Philippines, the police department’s budget is being strangled daily by rampant corruption. Police officers, including the half-hearted SWAT units charged with the perilous task of freeing the Hong Kong hostages, are under-paid and few are willing to risk their lives in the line of duty. “They just want to go home to their wives and children at the end of the day,” explained Lisa, a co-worker who sits three floors above me in the office. A cash-starved police force also means officers must muddle through the day with antiquated equipment and non-existent training. That explains why rescuers fumbled through the bus siege without so much as a step ladder, a battering ram or a pair of night vision goggles. And so it once again boils down to that third world woe: corruption. The subject is echoed by every Filipino I have talked to and is the singular reason why the Philippines is mired in perpetual poverty. The country is currently ranked 139th on the worldwide corruption perceptions index, below even Bangladesh, Uganda and Libya. In the Philippines, corruption is simultaneously the oil that greases the economic machine and the venom that poisons it. With half of the country’s GDP controlled by 15 powerful families, bribery is the only way money can seep through the crevices of the crony system. Every new government since Ferdinand Marcos, crowned the second most corrupt head of state of all time by watchdog organization Transparency International, has run on an anti-corruption platform but none has made even a dent on the viper’s nest. In my past visits to Manila, I tasted first-hand the poison of corruption that flows through every vein of society. In the wealthy Makati City neighborhood within the greater metropolitan area, my friends and I couldn’t get through the day without passing out “coffee money” to umpteen police officers like it was Chinese New Year in Hong Kong. In this week’s hostage crisis, corruption reared its ugly head and did so on multiple fronts. Corruption was what made the police department sack the gunman Rolando Mendoza a year ago, when the highly decorated cop got thrown under the bus for bringing drug charges against the scion of a powerful family in the Philippines. Corruption is what starves the police department of resources critical to keeping it afloat and capable of responding to emergencies like a hostage standoff. And corruption was possibly the reason why the Mayor of Manila ordered to have the gunman’s brother arrested in the middle of a hostage negotiation, a decision that defied all common sense and ultimately pushed the gunman over the edge. In the weeks and months ahead, citizens of Hong Kong are expected to step through the various stages of grief – denial, anger, bargaining and mourning – before we finally come to terms with the heart-wrenching tragedy. Similarly, the Philippines will take a bit of time to recover from the national embarrassment of staging the most disastrous rescue operation in human history. But perhaps embarrassment is the last thing its people should worry about. Until and unless the endless cycle of corruption is dealt with, this country has no future.